NHL Auctions and the MeiGray Group are offering you the chance to bid on game-worn AHL jerseys!! Choose from jerseys worn by Hugh Jessiman, Mike Santorelli, Dave Scatchard, Eric Meloche and more!! Game-Used Calder Cup Final Pucks!! NHL Auctions and the MeiGray Group are offering you the chance to bid on game-used Calder Cup Final pucks!! Choose from pucks scored by Alex Giroux, Cody Hodgson and more!! Choose from pucks used during the overtime of game 1, the second period of game 4 and more!! 2009 AHL All-Star Skills Competition Jerseys!! NHL Auctions and the MeiGray Group have teamed up to offer 2009 AHL All-Star Skills Competition used jerseys!! Each All-Star wore his individual teams' jersey for the competition. Choose from jerseys worn by Derek Joslin of the Worcester Sharks, Corey Locke of the Houston Aeros, Cory Schneider of the Manitoba Moose and more!! In addition, you can also choose from pucks used during the skills competition by your favorite AHL All-Star!! Hurry, Bidding Ends February 26th!! BID NOW!! 2009 AHL All-Star Classic Game-Used & Warm Up-Worn Jerseys!! NHL Auctions and the MeiGray Group are offering you the chance to bid on 2009 AHL All-Star Classic Game-Used Jerseys, 2009 AHL All-Star Classic Warm Up-Worn Jerseys and 2009 AHL All-Star Classic Game-Used Goal Pucks between PlanetUSA and PlanetCanada. 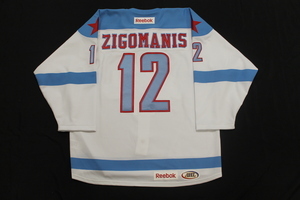 Bid on your favorite AHL player's jersey. Choose from Ryan Vesce, Bobby Sanguinetti, Chris Bourque, Mark Mancari, Tyler Weiman and more!! You can also choose from game-used goal pucks scored by Jeff Taffe, Artem Anisimov, Corey Locke and more!! Hurry Auctions End on February 12th!! BID NOW!! 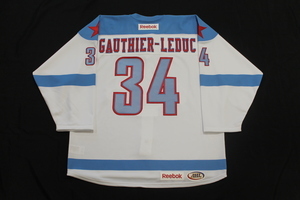 Up for bid at NHL Auctions are the 2008 AHL All-Star Game-Worn jerseys, presented by MeiGray. These jerseys were worn during the first period by both the Canadian AHL and the PlanetUSA AHL squads. Bid now on your favorite AHL'er or the top prospect from your favorite team. This auction ends tonight, February 26, at 9PM. Click here to see all the 2008 AHL All-Star Jerseys! Also up f or auction are vintage AHL All-Star Game-Worn jerseys. Many of these jerseys are signe d and go back to as far as 1995 worn by players such as Phillippe Boucher, Ray Emery, Ryan Miller, Trent Hunter, Jason Spezza, and more. The first group of these jerseys closes Tonight February 26, at 10:30PM EST and the second group closes March 6th, at 9PM EST. Click here to see vintage AHL All-Star Jerseys! MeiGray and NHL Auctions are proud to present more unique memorabilia from the AHL. Up for auction now are the All-Star Warm-Up Worn Jerseys from both the Canadian and PlanetUSA teams. The proceeds will benefit AHL charities including the Ace Bailey Foundation, and the Good Sports and Shriners Hospitals for Children. This auction ends February 12, 2008 at 9PM so hurry up and bid now! See all Warm-Up Worn Jerseys from the 2008 AHL All-Star Game!